Firstly, I have to start off by saying how amazing the decor is at Happy Dough Lucky. 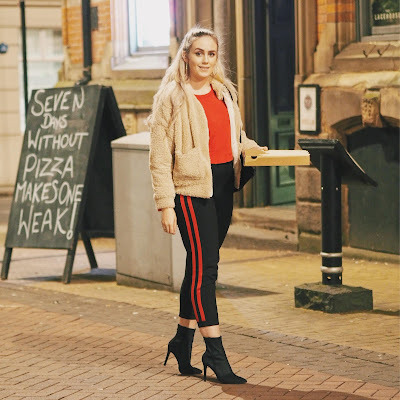 It's based inside the Lacehouse, a cocktail bar I have known and loved for many years, and whilst the decor has always been cool; they've really upped their game for their new boutique pizzeria. There's something Instagrammable on every space of every wall; cool neon signs (which as you've probably already seen on Instagram I just had to pose under), and the cutest little wall of polaroid pictures - which I'll explain later. Whilst waiting for our table, we were greeted with a passionfruit and mango rum cocktail, which was delicious and far too easy to drink. 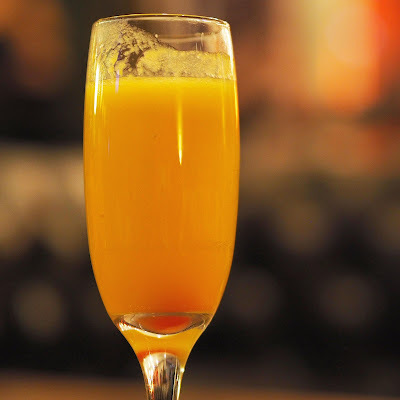 (Think liquid, alcoholic Solero and you're not far off!) When we made our way to our table, the owner and manager Sachin came over and stamped our menus which I thought was a really cool touch. 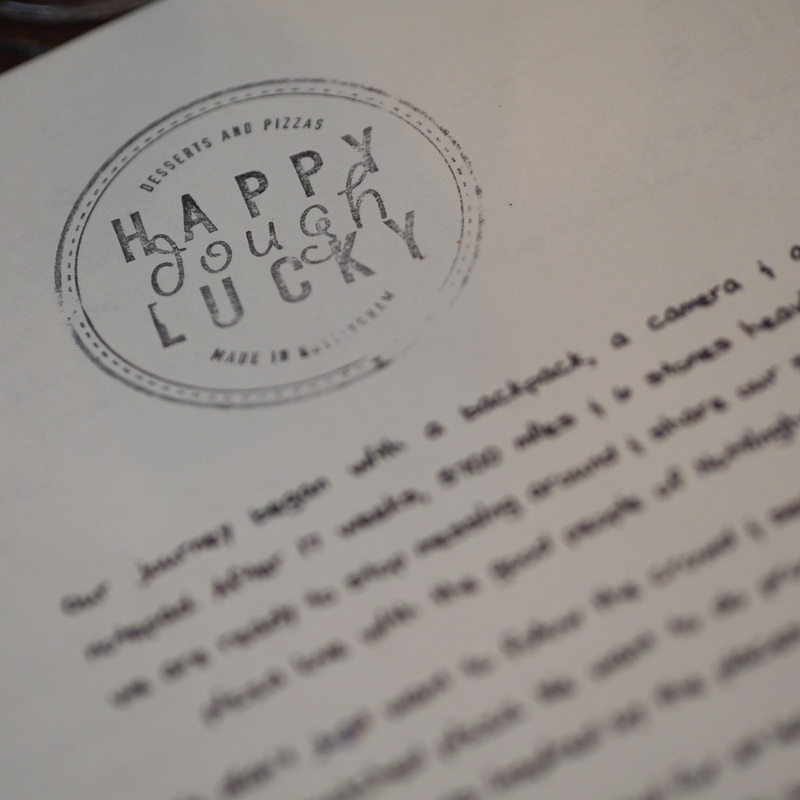 He then talked us through the concept and creation of Happy Dough Lucky and pointed out his favourite bits on the menu, whilst throwing in a funny anecdote here and there. And then the drooling commenced. 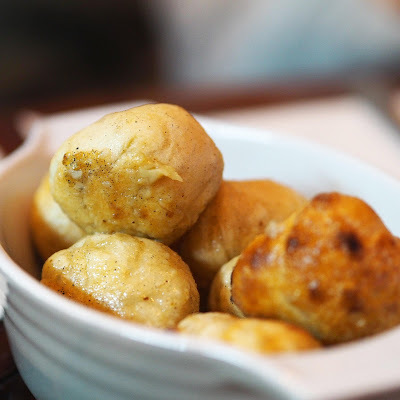 I went with my gal pals Sophie and Tiff and when the starters were served, (AKA garlic dough balls and chilli fries) I'd like to say that we were really polite, and shared them out slowly and equally. Alas. What actually took place probably looked more like an episode of Planet Earth, where a pack of vultures descends on a rotting carcus. Gross analogy aside, both starters were beyond delicious! I'm honestly not exaggerating when I say that these garlic dough balls are the best I've ever had. 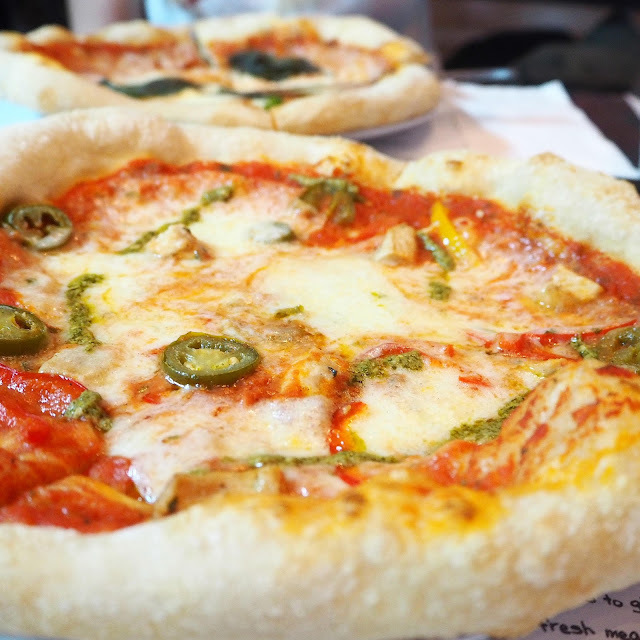 I've always loved Pizza Express' offering but whilst those are squidgy, these ones are perfectly crispy and crunchy on the outside, with a fluffy, soft inside. Plus they are pre-soaked and fried in garlic so no dipping necessary. Absolute heaven. 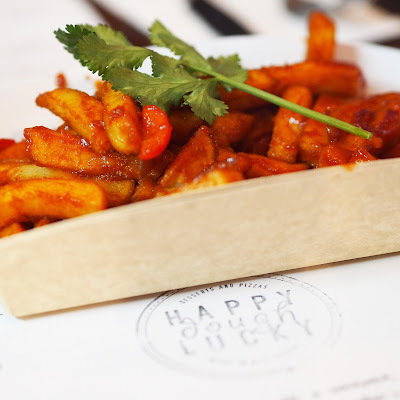 The chilli fries were so moreish and spicy as hell (which I love) but the chilli sauce they'd been slathered in had a really nice depth to it, so these were obviously scoffed up in no time. Onto the mains, and after much deliberation I went for a pizza topped with chicken, jalapeños, peppers and a whole lotta cheese. The chicken was so moist and juicy, and the pizza itself had the most amazing texture and taste. As delicious as it was, we were all thinking ahead about all the pudding we wanted to try - you know, for research - so opted to eat half and take the remaining half home to eat as a midnight snack to eat for lunch the next day. 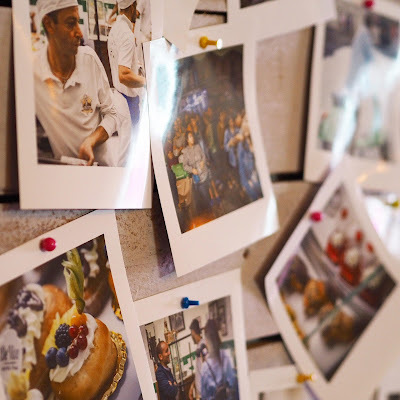 Sachin was telling us about the inspiration trip he took his team on ahead of the pizzeria's launch, where they ventured all around Italy and Morocco sampling pizzas, honing ideas and sourcing spices. (Sounds like a really tough job right?!) 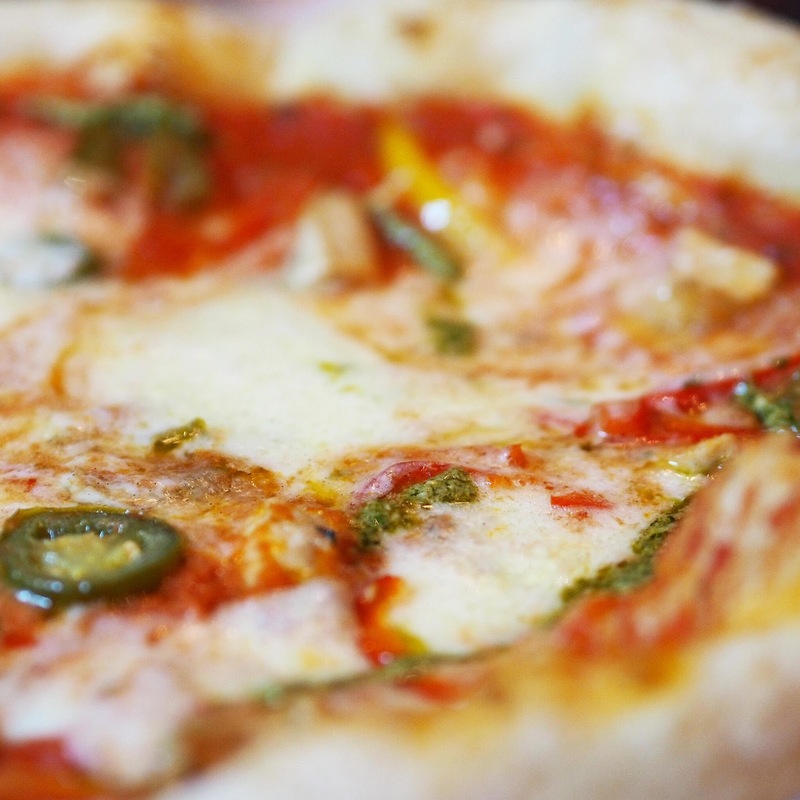 They all adored the Neapolitan style pizzas and wanted to bring them back to Nottingham with them and were also really passionate about being the only pizzeria in the city to use fresh dough. You honestly can tell from the funny imperfect circles the pizza arrives in and how fluffy the crusts are. Below is the epic polaroid wall I told you about, featuring photos from the team's inspiration trip. 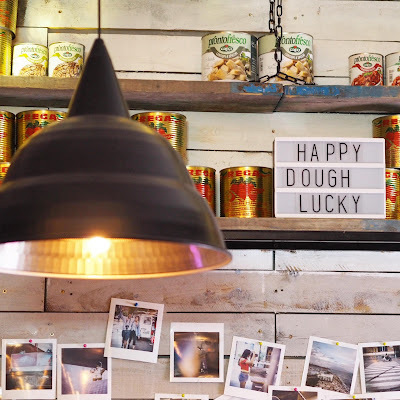 It's yet another perfect background for a cheeky Instagram shot, which if you caught Midnight and Lace's blog post on Happy Dough Lucky, you'll know already! Last but certainly not least... PUDDING. We made an absolute mountain out of a molehill trying to decide what to get for our third and final course. (First world problems, I know, I know!) 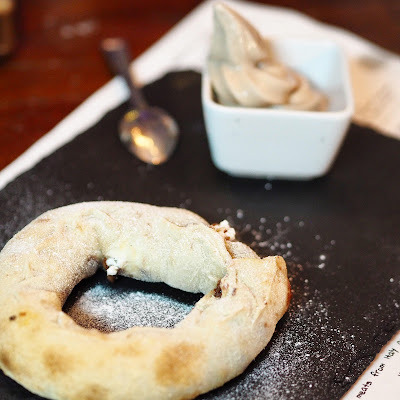 I finally settled on the hand rolled doughnut, piped with Nutella and ricotta. I'll start by saying that I would make the journey back to Nottingham right now ON FOOT just for this pudding alone. The combination of Nutella and ricotta was something I was somewhat apprehensive about, but OH MY LORD was it wonderful. The chocolate gelato - made with coco pops might I add - was the perfect cooling side dish next to the hot dough and chocolatey goodness. 10 out of 10 would bang. And I don't say that lightly. 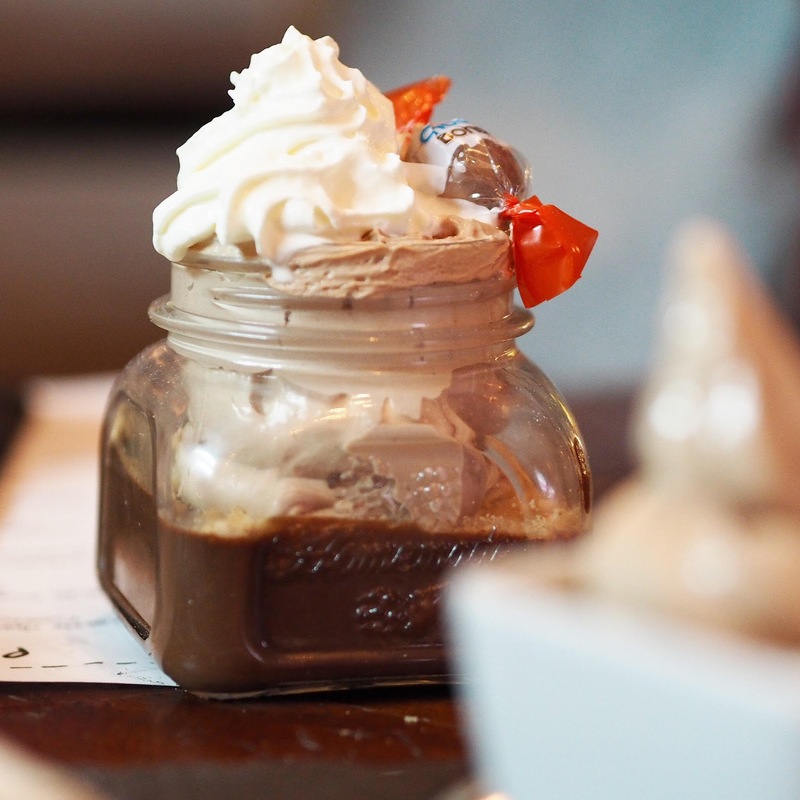 Sachin kindly brought us out the Kinder Bueno Surprise too, which was a dangerous combination of cookie, ice cream, Nutella and cream. Hell yes. I did try to get a photo of Tiff's pancakes too, as they looked divine, but she'd already started digging into them (shock) before I got the chance! 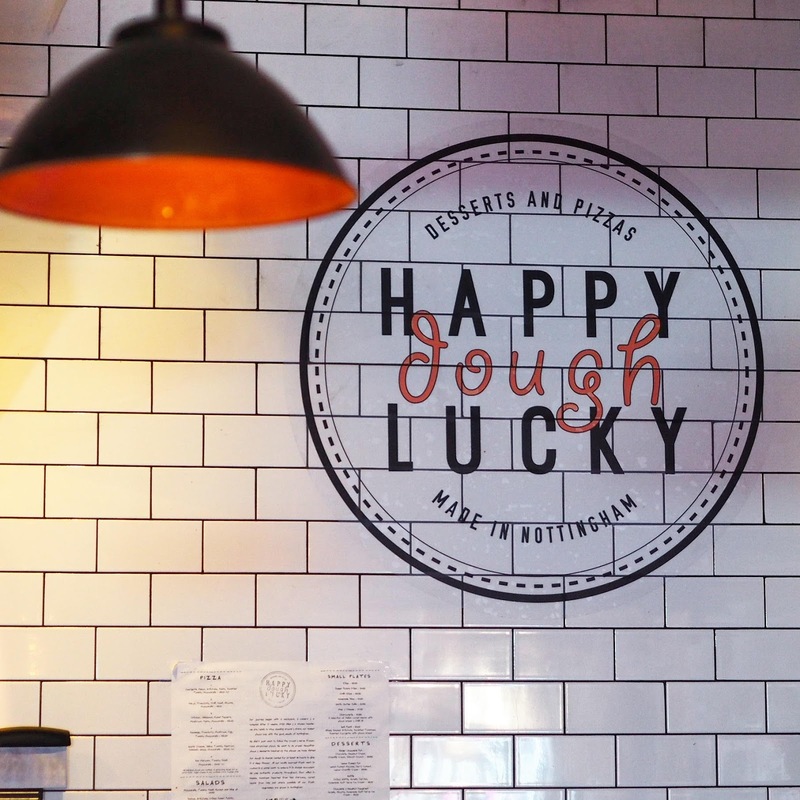 Overall I had the most amazing experience at Happy Dough Lucky. The service was fab (and hilarious) and looking around I noticed the same service and care was being given to both press and customers - which to me is hugely important. You can clearly see how much passion the whole team have for their food, and rightly so, it's bloody delicious. Currently the boutique pizzeria is only a pop up, but I seriously hope they re-consider cause I'm utterly in love. Either way I'd get your butts over there asap, you absolutely won't be sorry you did. Thanks so much to the whole HDL team for having us, I'll definitely be back again soon! I LOVE CARBS! I relate to your introduction completely - a girl can never have enough! 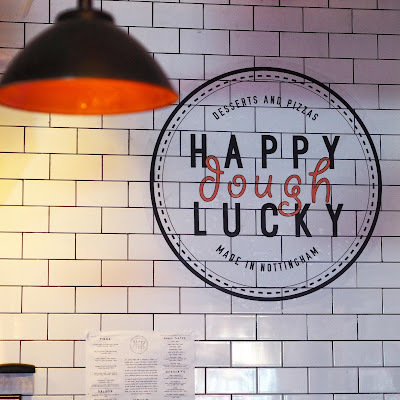 Pizza is one of my favourite treats to indulge in so I definitely need to hit up Happy Dough Lucky, it’ll be well worth the short trip to Nottingham for, based on your review! Eating half your pizza there and then taking the rest home is an inspired move because pizza for breakfast is always a good thing haha! And as for the Kinder Bueno surprise?! I am sold! Your photos are truly mouthwatering, thanks for sharing your thoughts! Izzy first of all I had no idea you were near Nottingham, we must be fairly close!!! As soon as I read the words pop up I am adamant I'm trying this out before it goes because it sounds AMAZING!!! I'm definitely a pizza lover, in fact throw me those garlic dough balls and chilli fries too! 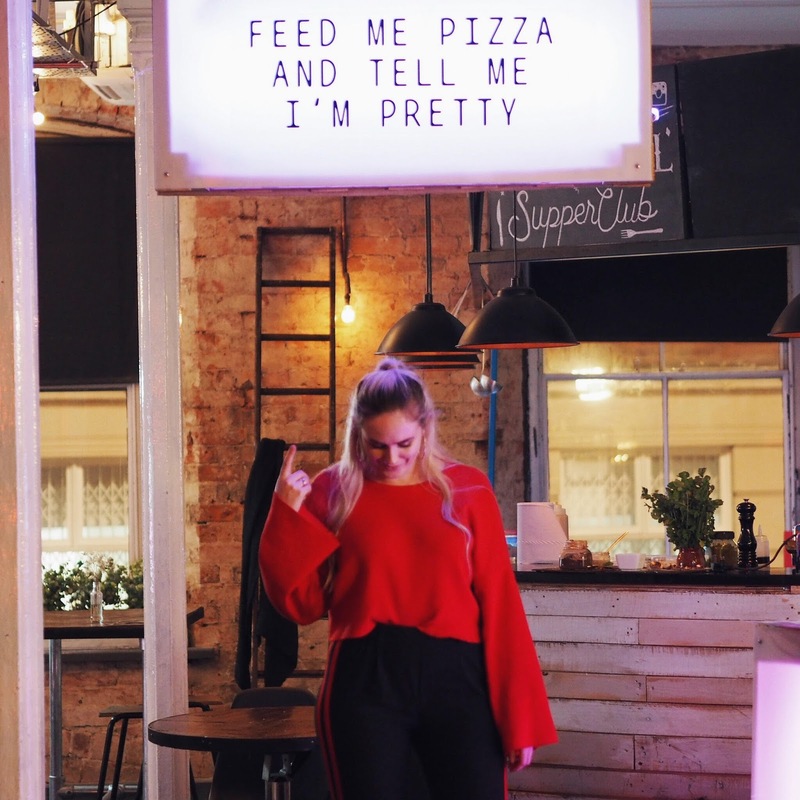 Sounds like you had a fab experience and I love the picture of you underneath the sign, you lil beauty! Everything sounds delicious but I need that Nutella and ricotta doughnut in my life!